PMS. We’ve all been there. Ugh, I know. AWFUL right? One would think the symptoms are totally normal though… that suffering is the price to pay for being a woman. We’re conditioned to believe our hormones are too wild to be tamed and our bodies are flawed. When did we become so disconnected? Perhaps in our younger years after first experiences with PMS and irregular cycles? Or after society clumped all things period related under one dark umbrella of misery? Ladies, it doesn’t have to be this way. It doesn’t have to be miserable. You can live a PMS-free life. The second half of your cycle (luteal and menstrual) is meant for slowing down and turning inward, when your intuition is crystal clear. To be honest, the luteal phase is my favorite phase because it’s when I get the answers I’ve been looking for and gain clarity. It’s when I get to do yummy yoga and take naps as needed. It’s when I yearn to check things off my list and feel the most productive. Not to mention it involves my favorite warming and comforting foods (that is – if you’re following my ‘Hormone Healing Meal Plan‘!). I no longer dread any phase of my cycle. Maybe I’m not jumping for joy at them (that’s a lie – I LOVE when my skin is extra glowy, plump and clear during ovulation phase), but I honor each one and enjoy the ride. 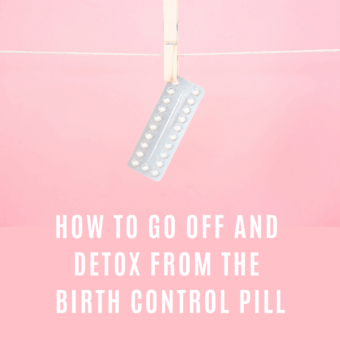 So, because PMS comes out to play during this second half, I’m sharing my top PMS Hacks for Cramps, Cravings and More with you today. 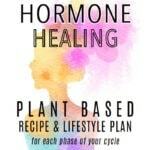 If you want to eliminate PMS symptoms completely then check out my plan. Also, check out my other hormone-related blog posts too. 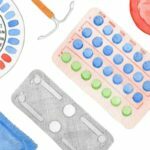 Otherwise, these helpful hacks will ease your symptoms and make that time of the month a little less icky. Fennel Tea – the one de-bloat hack that I SWEAR BY! Whenever I’m feeling puffy, bloating or am holding onto water weight, I drink a couple cups of fennel tea throughout the day and no joke, it works like magic. I even wrote an entire blog post dedicated to this tea and am so thankful for it! 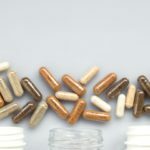 Magnesium Glycinate: This specific form of magnesium is a MUST for women of all ages! It helps balance the cycle, ease bloating, promotes good sleep/help with insomnia, and calms anxiety. Magnesium is an essential mineral and a true miracle worker for 300+ chemical reactions in the body. I take this at night before bed because it makes me so sleepy. I won’t go a day without taking it. CALM Magnesium Bedtime Tea: A different form of magnesium (citrate form), but also a must for me. This tea is ritual in my nighttime routine as it helps me wind down from the day but also helps with any digestion issues. 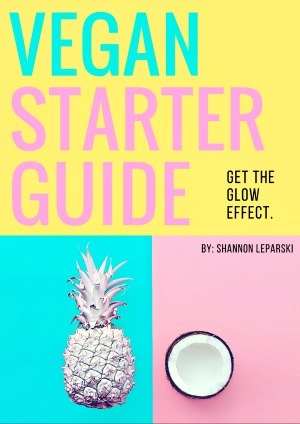 Read more about how to make it and how much to start out with in this post! Daily Probiotic – Also a must to keep your digestive system happy which will in turn help eliminate bloating. I’m obsessed with Renew Life Extra Care 50 Billion. Take before breakfast, with your morning water. 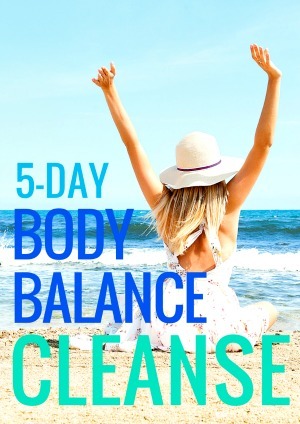 First off, you want to make sure your liver is effectively cleansing, ridding of toxins, breaking down excess estrogen and filtering out nasties from the environment. The liver plays a very important role in keeping us hormonally balanced and healthy – it has many jobs! Excess estrogen is a central cause of hormone imbalance, PMS and related health issues. So, if the liver is not effectively clearing out excess, it will be eliminated through the next best pathway – the skin!! Hence acne flare ups and oiliness, etc. 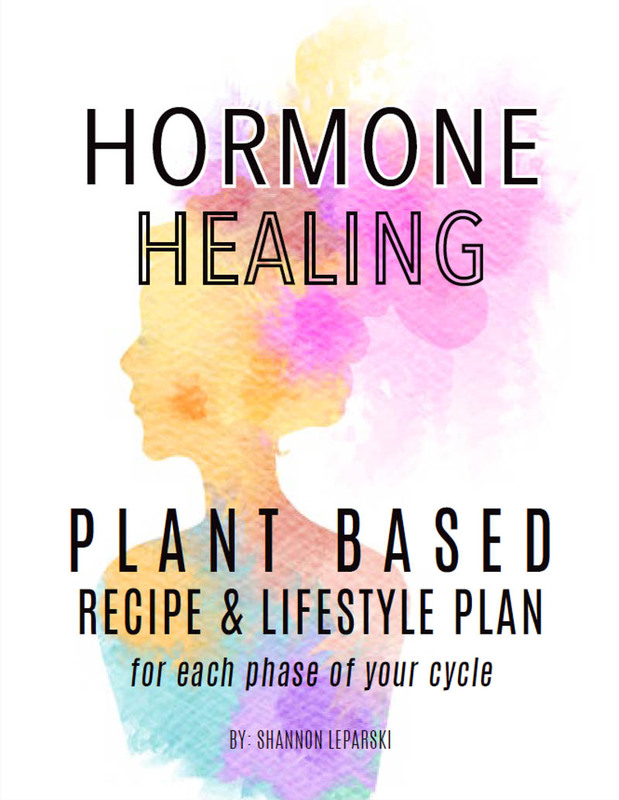 during peak hormone levels throughout the cycle. A sluggish or congested liver could also mean you may be holding onto excess weight and bloat as well. Make a detoxifying green drink in the blender with kale, cilantro, celery, cucumber, lemon and apple! Blend with water and ice until smooth. Drink this throughout the luteal phase! Eat more roasted root vegetables, steamed kale and spinach, steamed asparagus, broccoli and carrots as well as avocados and apples! Try my homemade Soothing Spirulina or turmeric face mask or this clarifying Blue Tansy mask. Be sure to gently exfoliate to slough away oiliness and dead skin, to prevent more blemishes. Try an enzyme cleansing oil (I’m obsessed with this B Vitamin Enzyme Cleansing Oil) and when my skin is feeling extra oily, I turn to the OSEA Cleansing Mudd because it works like a charm and exfoliates without rough ingredients. 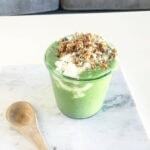 First, you must check out this post about iodine paired with selenium to eliminate breast tenderness and PMS cramps. Also including more omega 3 fatty acids in your diet will help to rid of painful PMS cramps. Foods like ground flaxseeds, chia seeds and walnuts, Taking a hot epsom salt bath seems to help too, especially when using a fun bath bomb! Crazy cravings are all too familiar for me! First it’s chocolate, then it’s anything salty, then it’s anything sweet and eventually becomes this rollercoaster! Cravings stem from blood sugar imbalance and/or micronutrient deficiencies. If you’re craving chocolate, you may be low in magnesium, which is why I always keep chocolate on hand, obviously. My favorites are from Endangered Species, Hu and Eating Evolved, but the vegan options are endless nowadays. If you’re craving carbs, that stems from blood sugar imbalance and/or B vitamin deficiency, which is why I take a high quality B-complex every morning, and it really does help! If you’re craving carbonated drinks, you may be dehydrated. Drink more water! If you’re craving salty foods, you may need extra minerals. Refined salt is stripped of minerals so it’s important you choose the right kind of salt. Start adding sea salt, sea vegetables (kelp, dulse, etc.) and water rich vegetables to your meals. 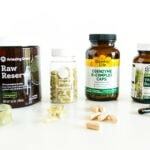 They are high in the full spectrum of minerals the body needs. Lastly, Get Chic Period Products – They Help! I’m never looking at those boring, neon colored tampons in the same way again. Cora created certified organic cotton tampons that look so chic and upscale, they’re almost too pretty to use (also – they sorta look like lipstick). Who knew?! Finally, a company that makes us feel modern and fancy. Cora is for the girl who wants to be #extra, but also looks out for ingredients, especially in her feminine products. 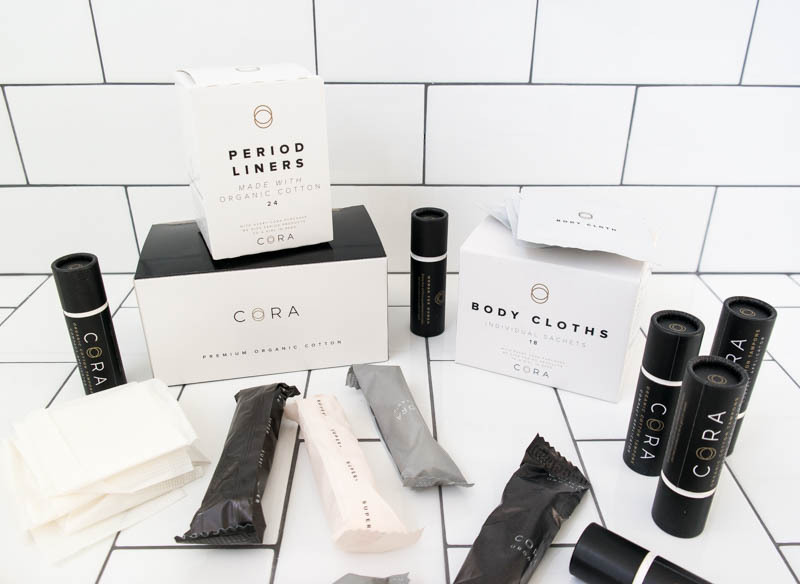 I’m obsessed with the packaging and branding too – not that you want to be sharing pictures of your chic tampons on instagram, but Cora kinda really makes me want to share them… they’re so photogenic. My shame is long gone so I just might do it! Every Cora product is made with pure, ethically sourced ingredients. When you buy Cora, you are not only protecting your own health, but also workers’ health, human rights, and the environment. Cora offers applicator tampons, applicator-free tampons, period liners and cleansing cloths, all conveniently delivered straight to your door! Purchasing the Cora products allows them to give back to women around the world. 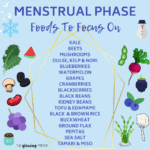 I hope this post helps with your period woes! Hopefully, your next cycle won’t be as bad. 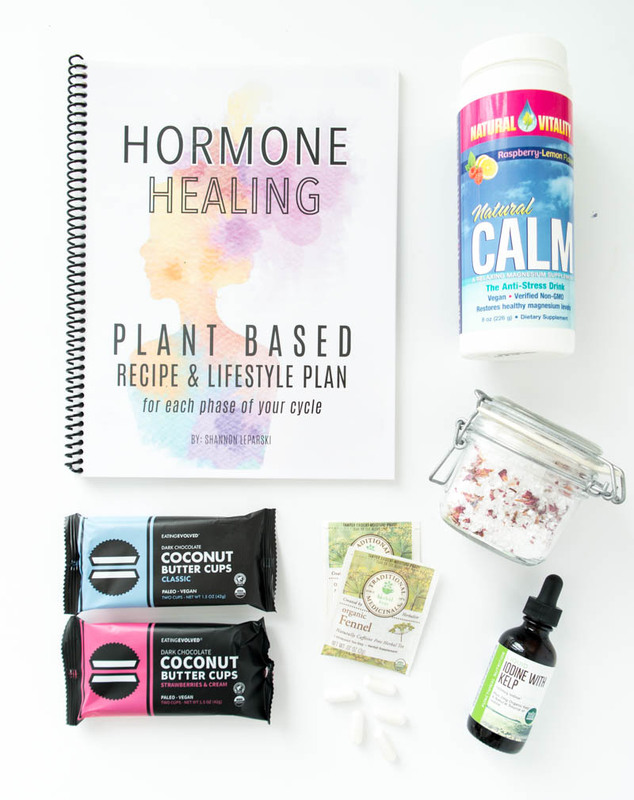 Be sure to check out my Hormone Healing Guide for a deeper dive into finding to the root cause, eating for your cycle, exercising for your cycle, finding the right supplements and living a healthy, hormonally balanced life for the long term!